Privilege of of a Member in a Suit. A BILL for calling Accomptants to Account for publick Monies received, was this Day read the Second time. Resolved, That this Bill be committed to Colonel King, Mr. Powell, Sir Anth. Irby, Sir John Temple, Sir John Cloberry, Sir Salomon Swayle, Mr. Knight, Mr. Eyres, Mr. Spry, Colonel Gerard, Sir Geo. Downing, Mr. Barton, Major Clayton, Sir * Hickman, Mr. Hobby, Mr. Prynn, Sir Rob. Brokes, Mr. Lowther, Colonel Shapcott, Dr. Clayton, Sir Wm. Lewes, Mr. Daniell, Mr. Dalton, Mr. Vowell, Sir Phillip Howard, Mr. Knightly, Mr. Hide, Mr. Chafe, Sir Roger Bradshaw, Sir Richard Onslow, Sir Lancelot Lake, Lord Aungier, Lord Viscount Valentia, Sir Tho. Meeres, Mr. Culliford, Mr. Shaw, Mr. Harris, Mr. Ellison, Mr. Ferrers, Colonel West, Mr. Rigby, Mr. Power, Mr. Mynors, Mr. Dalton, and all the Gentlemen of this House of the Long Robe: And they are to meet Tomorrow at Two of the Clock in the Afternoon, in the Queen's Court. 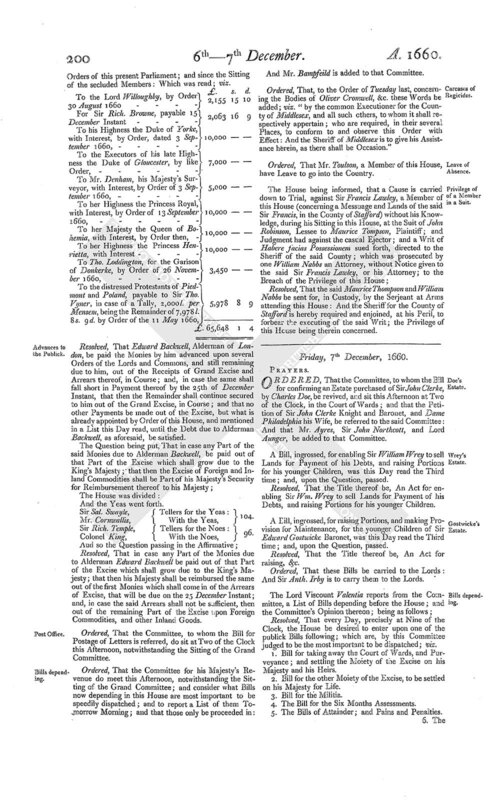 Sir George Downing reports Amendments to the Bill for restraining the Planting of Tobacco in England: Which he first read in his Place; and were afterwards read the First and Second time by the Clerk; and were after read by Parts: And the First and Second Amendments were, on the Question, agreed unto. The Third Amendment was read; and with some Amendments thereunto made at the Table, and the Omission of the Penalty on Justice of Peace, &c. Fol. 2. Line 8, was agreed unto. The 4th Amendment was read; and, on the Question, the Blank beginning Folio 2, Line 15, and ending Line 18, was ordered to be omitted. The Fifth Amendment was read; and, on the Question, agreed unto. A Proviso, reported with the said Amendments, was read; and with the Addition of these Words, "and Chirurgery," next after the Word "Physick," the same was agreed unto. Ordered, That the Fines set by this Act, be divided, One Moiety to the King's Majesty, the other Moiety to the Prosecutor, as is expressed Folio 2, Line 11, after the Word "aforesaid;" and that the Clause be inserted accordingly. Resolved, That this Bill, so amended, be ingrossed. Resolved, That Alderman Backwell be paid the Monies by him advanced upon several Orders of the Lords and Commons, and still remaining due to him, out of the Receipts of the Grand Excise and Arrearages thereof, in Course; and, in case the same shall fall short in Payment thereof, by the Twenty-fifth Day of December next, that then the Remainder be continued secured to him, out of the Grand Excise, in Course; and that no other Payments be made out of the Excise, but what is appointed by Order of this House, until the said Debt be satisfied to Alderman Backwell. Resolved, That in case any Part of the Monies due to Alderman Backwell be paid out of that Part of the Excise which shall grow due to the King's Majesty; that then his Majesty shall be reimbursed in such Manner, and out of such Monies, as the Parliament shall appoint. He also reports an Account of Monies that still stand charged upon the Receipt of Excise, by virtue of several Orders of this present Parliament; and since the Sitting of the secluded Members: Which was read; viz. Resolved, That Edward Backwell, Alderman of London, be paid the Monies by him advanced upon several Orders of the Lords and Commons, and still remaining due to him, out of the Receipts of Grand Excise and Arrears thereof, in Course; and, in case the same shall fall short in Payment thereof by the 25th of December Instant, that then the Remainder shall continue secured to him out of the Grand Excise, in Course; and that no other Payments be made out of the Excise, but what is already appointed by Order of this House, and mentioned in a List this Day read, until the Debt due to Alderman Backwell, as aforesaid, be satisfied. And the Yeas went forth. Sir Sal. Swayle, Tellers for the Yeas: 104. Sir Rich. Temple, Tellers for the Noes: 96. 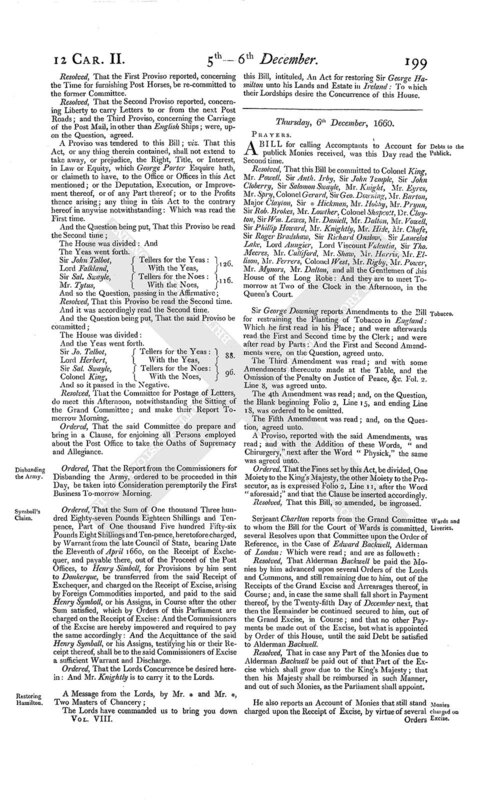 Resolved, That in case any Part of the Monies due to Alderman Edward Backwell be paid out of that Part of the Excise which shall grow due to the King's Majesty; that then his Majesty shall be reimbursed the same out of the first Monies which shall come in of the Arrears of Excise, that will be due on the 25 December Instant; and, in case the said Arrears shall not be sufficient, then out of the remaining Part of the Excise upon Foreign Commodities, and other Inland Goods. Ordered, That the Committee, to whom the Bill for Postage of Letters is referred, do sit at Two of the Clock this Afternoon, notwithstanding the Sitting of the Grand Committee. And Mr. Bampfeild is added to that Committee. Ordered, That, to the Order of Tuesday last, concerning the Bodies of Oliver Cromwell, &c. these Words be added; viz. "by the common Executioner for the County of Middlesex, and all such others, to whom it shall respectively appertain; who are required, in their several Places, to conform to and observe this Order with Effect: And the Sheriff of Middlesex is to give his Assistance herein, as there shall be Occasion." Ordered, That Mr. Toulson, a Member of this House, have Leave to go into the Country. Resolved, That the said Maurice Thompson and William Nabbs be sent for, in Custody, by the Serjeant at Arms attending this House: And the Sheriff for the County of Stafford is hereby required and enjoined, at his Peril, to forbear the executing of the said Writ; the Privilege of this House being therein concerned.